“20th: Captain H A Pearson (Canadian YMCA) came and arranged for a house in the town to be appropriated for his use, for a branch of the YMCA for all troops in the town. A house was allotted ... near the POPERINGE gate. 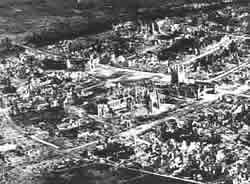 Damage caused to the historic buildings in Ypres from April 1915. During the next 24 hours most buildings in the centre of the town, including the famous medieval Cloth Hall (the Lakenhalle) and St. Martin's cathedral, were on the receiving end of heavy shelling, which was the beginning of their systematic destruction.